If there is another election soon it is vital that the Tories have policies that are appealing to voters and their own base. The party needs to appeal to young, working class and middle class urban voters. I suggest that the four main planks should be on housing, investment, infrastructure and a stable Brexit. 1. Housing and rents. Rents are very high in most prosperous parts of the country and many people, especially young people, spend half their paycheques or more on small, cramped flats. Renting is insecure, and Labour’s rent controls and three-year lease policies are appealing to anyone who has had a bad landlord. The Conservatives have to embrace reforms that will change this. And for rents to fall, we need more houses. Even if the green belt is an untouchable third rail, there’s a lot that we can do within cities to allow denser and more liveable developments. Get rid of height restrictions, allow people to add extra stories to their properties, allow streets to be turned into terraces, and stop micro-managing design. Give councils a financial incentive to allow more development by giving them the power to buy land without planning permission and sell it off with permission, or sell off planning permission directly. Neutralise Labour’s advantage on long-term leases by offering something similar (we’ll have more on this in the coming weeks). Rent controls would be stupid but the Conservatives must have a bold vision for cutting the cost of housing if they want to win younger voters. Corporations that make capital investments are required to deduct the costs of these investments over a number of years according to a schedule. Asset lives vary by type of assets and countries vary in how quickly they allow companies to depreciate them. The longer capital assets are written off, the more corporations need to pay and the more the government collects in tax over the life of an investment. This is because deductions made over time lose value due to both inflation and the time value of money. 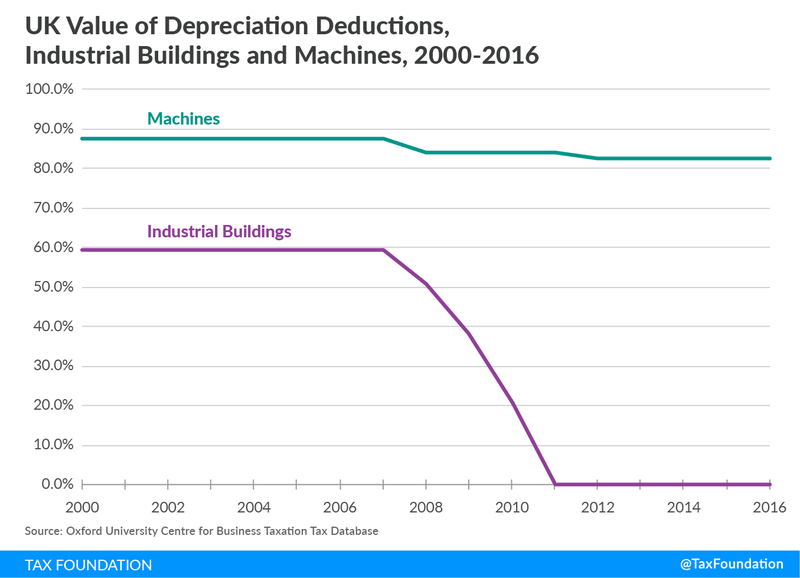 In one respect Osborne’s corporation tax cuts made this worse, because they were partially paid for by reducing the value of deductions for machines and industrial buildings. Corporations now cannot write off the cost of investing in buildings at all. This means that, in effect, many forms of investment face higher taxes under the new regime than under the old one, even though the headline rate is lower. This is counter-effective. Along with this, business rates act as a tax on property and machinery investment because they are calculated on the basis of the property value, not the land value. The more you invest the higher your tax bill. All of this means less productive jobs and lower wages for ordinary workers. The Tories need to change this. If they propose immediate expensing of all business investment, they will have effectively replaced the corporation tax with a “cash flow tax” that does not tax business investment. It could be doing revenue-neutrally without raising the headline rate with some other tweaks to the system (like the tax favouring of debt over equity financing). Labour were able to win people over to taxing corporations more — this reform ensures that we wouldn’t be taxing businesses that invest. Combined with a reform to business rates, it would be rocket fuel for the economy and produce a surge of investment that would mean better jobs for workers, and the kind of capital-intensive, manufacturing jobs that people really seem to want. 3. Privately-funded infrastructure. As the Telegraph’s Juliet Samuel has pointed out, pension funds hold trillions of pounds that they are dying to invest in safe projects that will give a steady, reliable, return. Infrastructure — new roads, railway lines, airports and more — can do that. Australia’s system seems to work: the government builds, then sells to investors upon completion. They get a new, safe asset, and we get a new railway to ease the pressure on other ways of getting to work. This, and other infrastructure spending, doesn’t have to be done by central government. Giving local government the power to issue bonds to fund new capital projects and decentralising transport spending would help to end the London-centricism that ends up with 84% of total UK infrastructure spending going on London and the South East. They said it offered the electorate a chance to show the world we backed our prime minister’s plans for a hard version of Brexit, and to make no compromises on immigration and the European Court of Justice. They said that victory on June 8 would be the vindication of a rougher-edged, more populist model of Conservatism than the soppy and limp-wristed model Cameroons had tried to build. Fair enough, then. Let this election be the test of that hypothesis. I think it’s now clear that the Conservatives will be badly punished if they push ahead with a hard Brexit, and it’s unlikely that they’ll be able to anyway with Scottish and Northern Irish MPs now being so important to the new government’s majority. Jeremy Corbyn is just a few MPs away from power and we cannot afford to have the sort of recession that a hard Brexit would likely cause. Brexit has not turned out to be the electoral trump card that May thought it would be. Brexit should still happen, because that’s what people voted for, but it should be as smooth an exit as possible and one that can win the support of most of the country. Forcing through a hard Brexit, where we leave the Single Market and face substantial regulatory barriers to trade with Europe, would be an economic and electoral disaster. The Tories should offer to take the politics out of the Brexit process, bringing in representatives from Labour, the SNP and the Liberal Democrats to the process and aiming for a final deal that can win support across the House. Something like a cross-party war cabinet. Labour might reject this. If they do, fine. But Brexit is the most important event in post-Cold War British history, and for a minority government to force their version of it through after failing to win an election during which their Brexit stance was one of the key issues would be potentially disastrous. Freedom of movement could be moderated to be a ‘free movement of workers’ — any EU citizen with a job offer may move to Britain, but otherwise, no. An “EEA Option” like the one I outlined immediately after the Brexit vote would get us out, but avoid the risk of a major recession and long-term fall in incomes. Softly does it. We need a manifesto that uses the private sector to solve the problems that low- and middle-income household have, and does not throw the country into recession just to win some pyrrhic victory over Brexit. The cack-handed, intellectually bankrupt clique that gave the Conservative Party one of its worst humiliations in its history on Thursday will never give us this. I hope eventually we get a Conservative leader who will.